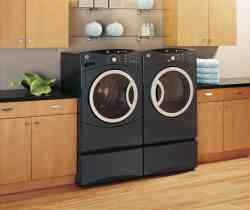 Some tips for adding a Washer/Dryer on the 2nd Floor including reducing the noise. Adding a laundry room to a second floor involves more than just picking new appliances. You'll first need to determine if the second floor can even handle the extra weight, vibrations, water and more. Schlepping a load of dirty laundry from the bedroom to the basement or utility room can be a pain in the hamper. That's one reason more homeowners prefer locating the laundry room closer to the source of most dirty clothes and linen, according to a survey by the National Association of Home Builders. Some homeowners are even adding second washers and dryers to master-bedroom suites and guest rooms. Structure: An engineer can help determine whether your home, or house plan, can accommodate a second-floor laundry. Planning the space, meanwhile, is best left to an architect, who can also incorporate necessary mechanical changes into the design."